Goldwell Color Glow IQ products feature the latest breakthroughs in hair care technology to provide salon specialists and their clients with consistently superior results every time when adding highlights and color that last and last. For exceptional support of color-treated hair, Goldwell is proud to introduce ColorGlow IQ products. These intelligent hair care products – from shampoos and conditioners to leave-in treatments and masques – ensure the longest lasting, healthiest and most vibrant hair color between salon visits, with minimal hassle. After achieving those perfect Goldwell results in salon, clients will find effortless maintenance of Reds, Browns, Blondes, Highlights using Goldwell ColorGlow IQ hair care products – designed to protect colored hair against fading and bleeding while cleansing and conditioning. 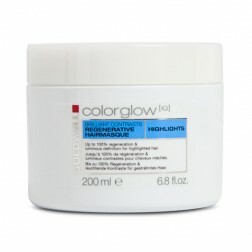 Goldwell also offers pre and post color treatments for hair in the ColorGlow IQ line – products that are powerful yet gentle, for long lasting results treatment after treatment. For the looks that illuminate the catwalk, restaurant or boardroom, Goldwell Gloss Infusion is an easy to use leave-in treatment that delivers 8 weeks of brilliantly glossy hair, with one treatment a week. The key to achieving the looks the top stylists and their clients desire are here – in the ColorGlow IQ line of products and other industry-leading Goldwell products available wherever fine hair care products are sold. 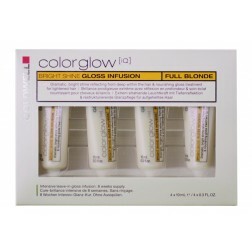 ColorGlow IQ: Main Goldwell ColorGlow IQ products keep the color in, letting salon clients maintain their perfectly brilliant Goldwell color treatments between salon visits. ColorGlow IQ is available in the form of shampoos, conditioners, leave-in treatments, masques and infusions that are simple to use, while helping to ensure that hair color doesn’t fade, bleed or drift. ColorGlow IQ offers the look of “just styled” perfection for weeks to come, by virtue of easy-to-apply products that not only protect hair’s color – they nurture and protect hair structure, for healthier, more vibrant hair everyday. No matter what type of hair you have, Goldwell ColorGlow IQ offers support and longevity for a wide range of highly desired hair shades. Warm Blonde and Cool Blonde tones will glow like never before, for weeks and months to come with Highlights Brilliant Contrasts. Shades of Red Cool and Red Warm, Brown Cool and Brown Warm will offer up their rich, brilliant luster to admirers for when you apply the gentle, easy-to-apply home treatments in the ColorGlow IQ line from Goldwell. Achieving and maintaining excellence in fashion and beauty has never been easier. For those who dare to have more fun, ColorGlow IQ’s formula for Full Blonde nourishes, protects, supports and even regenerates hair to yield the most brilliant, gorgeous blonde hair shades possible. Goldwell ColorGlow IQ is a complete system, featuring pre color and post color formulas that gently work with hair to achieve maximum color longevity and superior tone and shade. This revolutionary BackBar formula features color-protecting nano-molecules that work deep within the hair’s structure to lock in color, along with grape seed extract and essential oils, Q10 Enzyme and UV protection to protect hair from age and external stressors. The three components of this industry-leading BackBar hair color pretreatment are ideal for highlighted, colored and toned, and lightened hair.